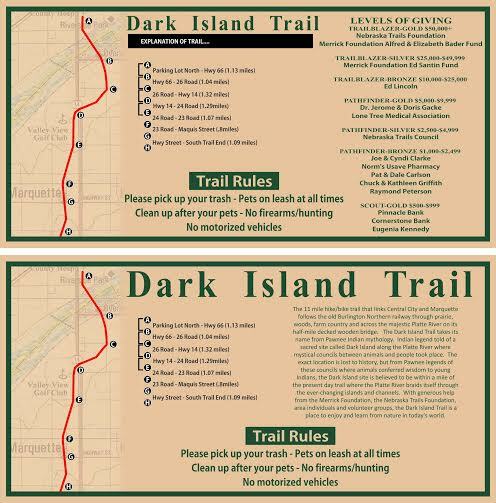 The Central City Area Chamber of Commerce held a ribbon cutting for the Dark Island Trail on Thursday, August 6th for the completed 10 mile portion of the trail between Central City and Hwy 66. The City of Central City purchased the abandoned railway from Hwy 30 to 1 mile south of Central City in October of 2014. A Peter Kiewit grant awarded to the Nebraska Trails Foundation allowed for developing this segment of the 10 mile trail. Roger Knight of Knightworx was contracted to prepare and develop the surface of the trail. He also installed or repaired three parking areas on 28th street, Hwy 66 and the trailhead 1 mile south of Central City. The Central City Trails Group, Central City staff, and a host of volunteers contributed many hours of labor and materials to install signage and provide improvements on the trail.